Crafting is an important part of Anthem. It will allow you to obtain new weapons, gear, upgrades and consumables without having to wait for them to drop from monsters. In order to craft, however, you’ll need blueprints and materials. The schematics can be hard to find, but there are plenty of materials everywhere you look. If you’re wondering how to craft weapons, gear & consumables in Anthem, this guide will explain the whole process in detail. Since items of all kinds will drop from enemies you defeat, you might be wondering why anyone should bother with crafting. Well, the truth is, you shouldn’t – at least not at first. Crafting starts making sense once you start getting items with inscriptions (the additional attributes below the stats). Since you can’t affect the inscriptions you’ll get, crafting the same weapon over and over is the fastest way to get a god-tier version. 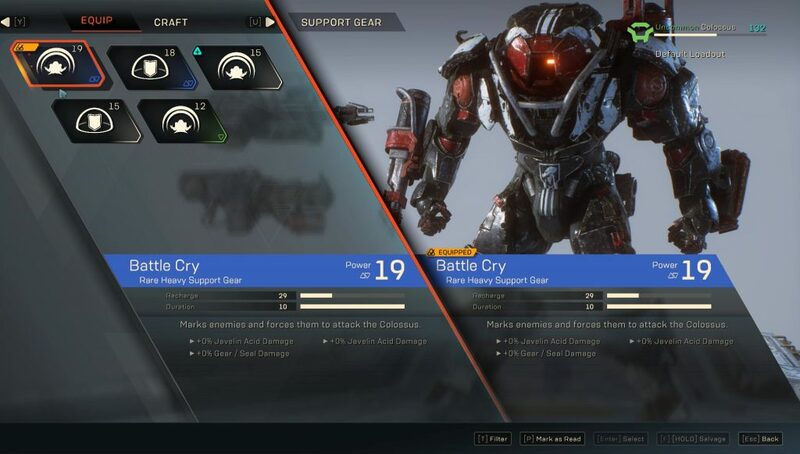 How to craft items in Anthem? First of all, you’ll need a blueprint. You’ll get these by playing through the story missions, completing challenges and generally doing stuff around the game’s world. Completing the challenges tied to a certain weapon will award you with higher rarity blueprints for said weapon. Once you have a blueprint, you can technically craft an item by visiting the forge at Fort Tarsis. However, you’ll also need the appropriate materials. If you’re crafting a weapon, you’ll need weapon parts. You can get these by dismantling weapons you don’t want. If you’re working on a javelin upgrade, you’ll need parts for that specific javelin (shock, interceptor, ranger or colossus). Same as with the weapons, you’ll get these when you salvage javelin gear. Lastly, no matter what you’re looking to craft, you’ll need planetary materials. These can be found in plant and mineral nodes across the map, as well as in loot containers. Once you’ve got everything you need, you’ll be able to spam the craft button until you get something with the right combination of inscriptions. Just consider it a way to reroll an item’s stats.